Joint-manager Ian Skinner believes Blyth AFC ‘switched off’ as they conceded three second-half goals against Ashington at the weekend, writes Andrew McDonnell. The Braves found themselves 4-0 up and in full control after half-an-hour, Bobby Taylor opened the scoring and Dan Wilson scored a hat-trick inside nine minutes. However, it was a nervous finish to the game after the Colliers pulled it back to 4-3 on 90 minutes and Skinner was ‘disappointed’ the team didn’t continue on from their positive first-half performance. He said: “It’s a horrible scenario because all you can do is focus on the positives and talk about (at half-time) the things we done well in the first-half. “We said we needed to continue to do the same things in the second-half and maintain our standards, play to the level we’re capable of and not switch off. “Everything I’ve said there, we did. We switched off, we didn’t retain the ball anywhere near as well as we can. “Ashington, to their credit, had a right good go – went 4-2-4, four quick lads across the width of the pitch up top and went back to front as early as they could. Ashington were awarded a penalty after just two minutes, Kyle Oliver going shoulder-to-shoulder with Zak Atkinson, who fell to the floor in the penalty area. Chris Bannon kept out Kyle Downey’s spot-kick and the visitors went on to dominate after opening the scoring through Taylor on 13 minutes. It could’ve been more than 4-0 at half-time, with the Braves creating chances freely, and that is one part of the game that pleased Skinner. The joint-manager added: “We took a little bit of time to find our feet and, slightly against the run of play, Craig McFarlane had played a fantastic ball from right to left. “Bobby Taylor got in and finished it and from that moment on, we came to life. I have to mention Chris Bannon saving a penalty, that’s a big moment after three minutes. “After we scored, I thought we dominated the rest of the first-half. We were aggressive out of possession, we looked to press Ashington. “We got the ball back early and every time we won the ball back, we looked to counter-attack with pace. 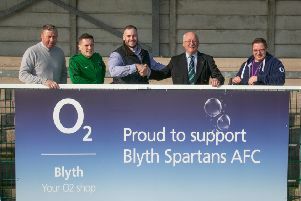 Blyth AFC are back in action on Wednesday evening, they host Seaham Red Star in their first home game of the new season. Kick-off at Woodhorn Lane is at 7.45pm.